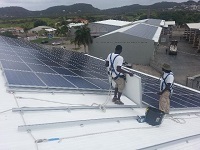 Comet Solar is focussed on commercial installations such as the Valumart Supermarket in St. Kitts. 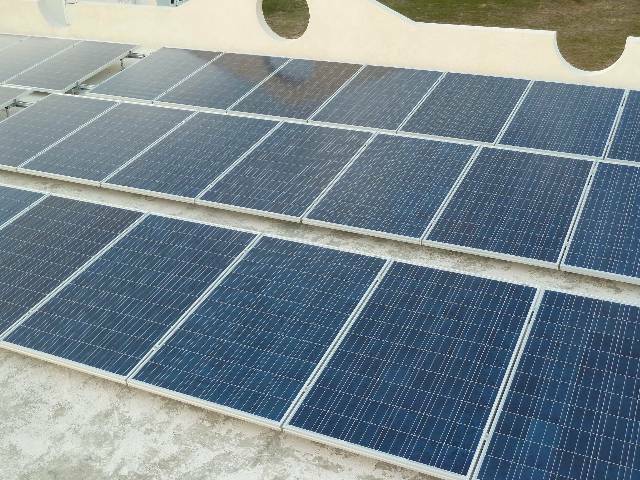 Commercial Solar offers tremendous financial returns in the Caribbean due to the high cost of electricity and the ability to consume the power as it is made. Companies can expect a return on investment as high as 33% and a break even of three years. It is essential that commercial solar be installed by an experienced contractor in order to assure the long term financial goals of the customer. Comet Solar is an experienced commercial solar and electrical systems contractor. Generac Industrial Power has solutions to meet the needs of almost any emergency or standby power requirement. Whether you’re the specifying engineer, installing contractor, or customer, we offer a wide variety of information and tools to help you understand our products and capabilities. When you or your customer’s business can’t afford to be without power for even a second, you need Generac for reliable automatic standby power. With the cost of electricity topping US$ 0.43 in most of the Caribbean, hotels, business and governments are equally feeling the the pain. Combined with the economic downturn and the worst tourism season the Caribbean has known in recent times, the picture is bleak. Read on and find the solution! The cost of energy has a direct affect on hotel room rates in hotels, profit margins, and budgets. If the prices continue to increase, as we expect, the future of many of our facilities will be in doubt. Costs continue to spiral but the amount of visitors and customers is at a historic low. 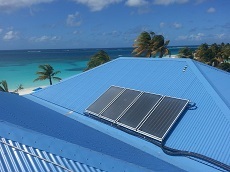 For many years the installed cost of solar of a solar system was too high to be attractive to Caribbean Hotels, Resorts, and Businesses. All that has now changed. Our approach offers you affordable systems that will reduce your energy costs and will realize a very attractive return on investment. Read on to discover how you can get the most attractive Internal Rate of Return. We get a lot of questions about the "Break Even Point" of solar systems. A commercial solar system is an investment which should be viewed as a cash flow. With today's electricity prices, a commercial solar system can realize an Internal Rate of Return of 30% p.a., and will only get better as fuel prices increase. How does an investment return of 30% per year sound? Can you get that anywhere else? Caribbean banks are typically paying less than 1% on US Dollar savings accounts. That's an insult! And while banks may seem a safe place to put money, so many banks are in financial trouble it may be a lot less safe than you know. Put your money to work for you, where you control it. A commercial solar system will return 20% to 30% per annum for 20 years. And unless the sun stops shining (unlkely), or the price of oil drops significantly (even less likely), your solar system will keep producing power for 30 years with little maintenance. 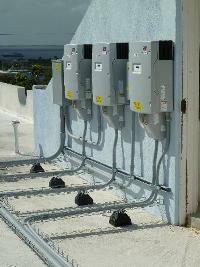 A commercial solar system is acutally the most boring piece of equipment on the property. It just sits there and works, every day. There is no maintenance and nothing to go wrong. You can buy and install a system yourself and it will produce some return, but the retail cost of solar equipment is not attractive enough for most commercial purposes. Installing a system of this size is not for beginners and there are safety issues to consider. HIgh voltages, grounding and bonding and code compliance are complex issues best left to qualified installers. Can you afford to experiment? Our systems achieve the IRR numbers because of the way we buy commercial products and because of our installation methods. Cost is everything and our systems are designed to keep your cost as low as possible. In order to acehive the IRR shown, the system has to last the duration of the investment period. Do you want to take a chance on inexperienced installers? Contact us to explore your opportunities. If you are in the hotel or villa business, our passive Solar Water Heating System can preheat your laundry water, heat your guest room hot water and save a huge portion of what you spend on electricity for water heating. If you are a home owner, you may never need to heat water again with electricity. Passive Solar hot water systems supply an average 80-90% of a household annual water heating needs. With nearly 1/3 of the average electric bill devoted to heating water, a solar hot water system is the best choice and smart investment you can make for your house and for the environment. Energy savings will pay for the system in as little as three to five years. 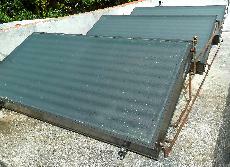 The Solar Water Heater is a self-sufficient system. Independent of electricity, it gives you the peace of mind that comes from knowing that your water heating bills will not increase. It also allows you to enjoy hot water even during black-outs. Our commercial solar water heating systems have active pumps and controllers to ensure the water is at the right heat all the time. Temperature sensors on the collectors and in the tank measure teh temperature difference between the roof mounted collectors and two locations in the tank, and run the circulating pump if there is sufficient temperature differnce to heat the water in the tank. Electric elements are used to raise the temperature at programmed times to ensure there is always hot water for your guests when they wake up in the morning. Power. Our lives depend on it. From everyday necessities like heating, cooling, refrigeration and lights, to daily essentials like cooking, laundry or kids bath times. Power outages are occurring more frequently than ever and lasting longer with devastating effects. Hurricanes in the Caribbean cause long outages and can leave without power for days at a time. Stand up to unpredictable weather and unforeseen outages with the most trusted name in residential standby power. If the power ever goes out, your Generac standby generator goes on - automatically - protecting you and your home 24/7. Comet Systems is proud to be appointed a service dealer for Generac Generators. We offer residential generator in stock supported by trained technicians. Generac's OHVI engine was designed specifically for generators. It outperforms competitive generator engines with an engine life that is three to four times longer and has a significantly longer period between scheduled maintenance checkups. 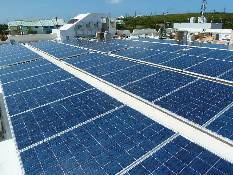 Keep up with solar developments in the Caribbean.